Hydrate Core Processing – Geotek Ltd. 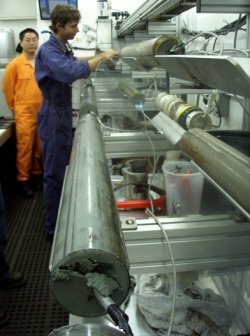 Conventional cores that may contain gas hydrate must be rapidly imaged and processed before any remaining gas hydrates – or gas hydrate signatures – disappear. 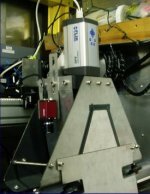 The Geotek whole-core processing van allows rapid infrared imaging of core using the Geotek MSCL-IR in a controlled-temperature, shaded environment. Core can be sectioned and measured in an MSCL-S in the same container before moving to a storage/archiving facility or on to split-core processing. Thermal imaging using infrared cameras is accepted by the scientific community as the most pragmatic way to determine the overall hydrate distribution in a sediment core and throughout the sedimentary section. The Geotek MSCL-IR thermal infrared imaging system consists of a computer-controlled infrared camera mounted on a skate that moves incrementally along the core, rapidly capturing thermal images. Depth-registered thermal images of complete cores are obtained within minutes of the core being recovered. Concatenated images appended with an electronic ruler are displayed in real time on monitors distributed along the length of the track. The Geotek core processing laboratory is equipped with plenty of core racks for ease of core manipulation. Sampling and core cutting equipment, such as rotary core cutters, puncture samplers for void gas, and plug samplers for headspace gas or porewater are all available. Temperature probes are provided for direct temperature measurement if required, as well as a benchtop to wrap sections of core for storage in liquid nitrogen. 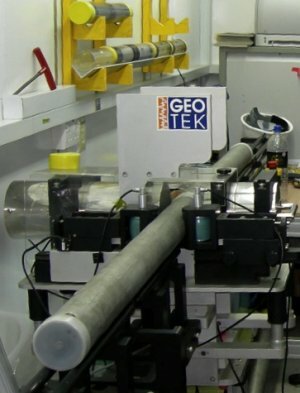 The Geotek MSCL-S measurement system makes computer-controlled measurements of gamma density, P-wave velocity, electrical resistivity, and magnetic susceptibility on whole cores. MSCL measurement on whole core provides a reference set of data taken from fresh core prior to splitting. Measurements can be used both intrinsically, for their actual values (e.g., gamma density, P-wave velocity), or as proxies for changes in lithology or formation environment (e.g., magnetic susceptibility). All the equipment described above is installed in a self-contained, transportable 20-foot laboratory container. This laboratory is fully fitted with lights, air conditioning, sink, uninterruptible power supplies, ethernet network, and file server. Infrared core imaging takes 5 minutes/4 metres of core. Core cutting and subsampling takes 30 minutes for an unremarkable eight metre core; a gas-hydrate-bearing core will take longer. Eight one-metre sections of core can be measured in the MSCL-S in 2 hours. These processing speeds require one dedicated scientist/technician, with three others available for half an hour to a hour when each core is acquired. Diameter: 5-15 cm; Length: 9.7m. Geotek MSCL-S with gamma density sensor, acoustic rolling P-wave velocity transducers, non-contact electrical resistivity sensor, natural gamma sensor and Bartington magnetic susceptibility loop sensor (MS2C).